We’d love your help. Let us know what’s wrong with this preview of How to Connect with Your Troubled Adult Children by Allison Bottke. Are your adult child’s mental, emotional, and physical health issues driving you to despair? Are you tempted to bail your son or daughter out of yet another impossible circumstance? When your child has reached (or long since passed) the point of independence, it’s difficult to know what your “help” as a parent should look like. Whether you’re facing these problems for the first time or looking to learn more, take a step back and develop effective strategies to truly help your adult child—without sacrificing your sanity. To ask other readers questions about How to Connect with Your Troubled Adult Children, please sign up. I was first introduced to author Allison Bottke’s work when I read her book “Setting Boundaries with Difficult People.” This subject matter has always been interesting to me and I thought her perspective was fresh with practical steps. 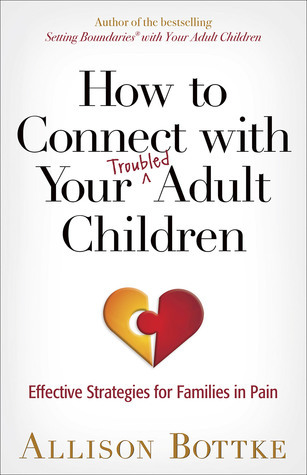 When I had an opportunity to get an advance copy of her newest book, “How to Connect with Your Troubled Adult Children”, I didn’t hesitate to sign up. One thing I should share is I actually don’t have a troubled adult child. But I do have other family members strug I was first introduced to author Allison Bottke’s work when I read her book “Setting Boundaries with Difficult People.” This subject matter has always been interesting to me and I thought her perspective was fresh with practical steps. When I had an opportunity to get an advance copy of her newest book, “How to Connect with Your Troubled Adult Children”, I didn’t hesitate to sign up. One thing I should share is I actually don’t have a troubled adult child. But I do have other family members struggling with boundaries, signs of mental illness and substance abuse. That being said, I think this book can help anyone who has a loved one that is struggling, a loved one that breaks your heart over and over due to their poor choices. In this book Allison has once again shared her strategy for dealing with things that are out of our control, like other people’s choices and consequences. She calls this action plan SANITY, which I find clever as well as fitting. The acronym stands for: Stop. Assemble. Nip. Implement. Trust. Yield. She goes into detail how each step works and I believe this can be applied to a lot of situations. Allison is a Christian and her writing is from the perspective of someone who has used her faith to guide her and help her surrender that which is out of her control. If you are not a Christian or have no basis for faith then this may not be a book that you would embrace. I found the scripture references and her ideas on where faith plays into the bigger picture of life reassuring. This book is as much about making sure you don’t lose yourself in the path of your child’s self-destruction as it is a tool to help you understand your child and their suffering a little better, but not in the way that it gets them off the hook for their choices. Rather, it teaches you that you can have compassion and relate to your child in a loving way without becoming a casualty in their path, but it requires setting some non-negotiable boundaries. This book is thoughtful and compassionate towards both the parent and the child. It is hard to look at the bigger picture of life and to believe that God has a plan for all of us. I feel Allison has done a great job expressing that in this book. I hope that all hurting loved ones can read this book and find the comfort and validation that they need to find peace, to let go and let God. *I gave it 4 stars only because I think the focus on faith may limit the book's audience. Parenting is a lifetime responsibility—even when your children become adults. Yet when they get into trouble, how do you respond? Do you enable or get manipulated? Allison Bottke is intimately familiar with these stories—from her own personal experience and also from a connection to thousands of other parents. If parenting has gone seriously amiss and your child has gone completely off the rails, this book is for you. The author lets you know you aren’t alone, gives you sound advice on how to deal with your child’s manipulations, financial demands, and repeated bouts with the law. Allison Bottke, known for her Setting Boundaries® series of books has once again produced a book that is candid and practical for the parents of adult children who have addiction, emotional, or mental problems. How to Connect with Your Troubled Adult Children is a follow-up to Setting Boundaries® with Your Adult Children meant to guide a parent with rational responses rather than emotional responses for the needs of their adult children who are unable to assimilate into a "normal" life of respon Allison Bottke, known for her Setting Boundaries® series of books has once again produced a book that is candid and practical for the parents of adult children who have addiction, emotional, or mental problems. How to Connect with Your Troubled Adult Children is a follow-up to Setting Boundaries® with Your Adult Children meant to guide a parent with rational responses rather than emotional responses for the needs of their adult children who are unable to assimilate into a "normal" life of responsibilities due to physical or emotional issues. One of my favorite parts was Six Steps For S.A.N.I.T.Y.! Using these steps will help clarify and form a plan of action that will be beneficial for everyone involved. This, coupled with templates of letters and contracts, can be used to establish boundaries that truly do make a difference. Uncertainty about rules and expectations raise already high stress levels. A single book is not going to resolve all of your issues, but the practical advice, empathy, and resources referenced make this an excellent book for those wanting a healthy relationship with their troubled adult children. The first step (or steps) to make a difference are up to you... and the changes you will to make. Parenthood goes through many seasons and you must adapt. I highly recommend How to Connect with Your Troubled Adult Children to guide you through uncertain territory. I was provided a complimentary Advance copy of the book from the author and volunteered for the opportunity to provide an honest, impartial review. I was not required to write a positive review and all thoughts and opinions I have expressed are entirely my own. Doing the same thing over and over again, expecting different results; is the definition of inSANITY. I certainly wouldn't have ever been on an Insanity bound freight train. I certainly have used Allison Bottke's description of S.A.N.I.T.Y with many people in my life, where I have needed it. She has made me keenly aware of things that I am still doing wrong. Boundaries are a great thing, and that sometimes distance really is a blessing. Depending on where you are in your relationship with your prodigal; Allison has so much information wrapped in this small book!! On of my favorite comment over all from Allison was "when you open your door to your adult children prepare to open your heart." Open minds, Open hearts!! But open the boundaries at the same time!! As if trying to connect with a troubled adult child isn't difficult enough,we also may find ourselves the target of friendly fire. Allison gives us practical ways to parent your TAC in the worst possible times for the best possible outcome. This is the third book I've read that Allison Bottke has written and once again, I am encouraged and enlightened by her book. Though she writes it from the perspective of the parent dealing with a troubled child, her book serves as a manual for relating to siblings, relatives and friends who are troubled. Allison herself is no stranger to troubled adult children as she is very forthcoming about her own struggles with her incarcerated son. Through tips, steps and personal stories in this book, th This is the third book I've read that Allison Bottke has written and once again, I am encouraged and enlightened by her book. Though she writes it from the perspective of the parent dealing with a troubled child, her book serves as a manual for relating to siblings, relatives and friends who are troubled. Allison herself is no stranger to troubled adult children as she is very forthcoming about her own struggles with her incarcerated son. Through tips, steps and personal stories in this book, the tools are available for developing healthy boundaries, healing and restoring your sanity in dealing with these types of individuals. While I don't have troubled adult children, I have struggled with a troubled sibling that I needed to learn to set boundaries. Allison's book is a great companion to 12-step groups and can help you become healthier and more equipped in dealing with anyone in your life that is getting the better of you. There is hope and help available! Her book is encouraging, heartfelt and uses scripture passages to reach her audience. I highly recommend this and all of her books to give you hope as well as the tools to survive and thrive. I cannot say enough about this book! I was introduced to Allison Bottke when I read “Setting Boundaries With Your Adult Children.” I was blown away in discovering how my actions were affecting my child in an unhealthy way. I truly thought I was helping!! In her newest book, “How to Connect with Your Adult Children,” I’m learning how to build on what I’ve already learned and continue to make better choices so that I can have a better life as well. This book is extremely easy to read. It helps tha I cannot say enough about this book! I was introduced to Allison Bottke when I read “Setting Boundaries With Your Adult Children.” I was blown away in discovering how my actions were affecting my child in an unhealthy way. I truly thought I was helping!! In her newest book, “How to Connect with Your Adult Children,” I’m learning how to build on what I’ve already learned and continue to make better choices so that I can have a better life as well. This book is extremely easy to read. It helps that Allison has actually gone through similar situations and c an actually relate to how I’m feeling. She has a way of making it all make sense. Even if we don’t have a child in trouble, we can benefit from the wisdom Allison has when dealing with our Adult children (or other family members). Allison gives many tips and steps to regaining your SANITY. This book is a treasure chest of knowledge and compassion and I’m so thankful to have found it and Allison Bottke. I truly feel there is hope! *I was provided a complimentary advanced copy of this book from the author and volunteered for the opportunity to provide an honest, impartial review. I was not required to write a positive review, and all thoughts and opinions I have expressed are entirely my own. After 20 years of searching and reading every book I could put my desperate hands on, here, in her latest books, “Setting Boundaries with Your Adult Children “ and “How to Connect with Your Troubled Adult Children “, I have finally found real life, common sense advice to start my journey to end the insanity and embrace the 6 steps to Sanity outlined in each book. What a relief it is to know we are not alone! Thank you Allison for not only sharing your heart-wrenching journey, but for giving us parents in pain resources to a path to freedom from the endless gerbil wheel of enabling and repeated mistakes. 2/3 done. Excellent book, rich insight, and very helpful. I had never heard of Allison Bottke before seeing a pre-release announcement on one of my writer's group pages. The title of the book got my attention, because I am a foster/adopt mom of adult children, a pastor's wife and also run a food pantry, so I deal daily with the drama of adult children who play havoc with their parent's dreams and goals. Every parent of a troubled adult child is crying out for a way to connect positively with their children who are adults, but don't act like it. Myself I had never heard of Allison Bottke before seeing a pre-release announcement on one of my writer's group pages. The title of the book got my attention, because I am a foster/adopt mom of adult children, a pastor's wife and also run a food pantry, so I deal daily with the drama of adult children who play havoc with their parent's dreams and goals. Every parent of a troubled adult child is crying out for a way to connect positively with their children who are adults, but don't act like it. Myself included. Having lived through many of the same experiences as the author in the issues my own kids have faced, I feel well-equipped to give a balanced opinion of the advice in this book. Gratefully, I was able to handle things in my own children's lives in the very way she suggests, in large part due to my own experience in helping other parents who struggle with the same issues. As a result, the ones I was most able to help in this way have turned their lives around to a remarkable degree. But I have to tell you that it was tough. Their is no sugar-coating saying no to your child when you fear that it could mean their death. That's the strong point of Allison's book, even if at times it seems she's beating a dead horse with repetition. But I also get that for a huge number of people who need this book the most, they haven't had the privilege of being raised in a Godly home, with very well-grounded teaching on how to handle this kind of issue. They haven't worked with countless other parents and seen the ramifications of enabling behavior. They haven't come to the conclusion that at a certain point the only way to save a person is to let them self-destruct, all the while trusting that God loves them more than we do. If He can save them, He will. If He can't, we have no prayer of doing so, anyway. Letting go of your hopes and dreams for your child gone bad, or who is dealing with mental and emotional illness, and facing the new reality is one of the hardest things a parent can do. The advice Allison gives is solid. Her own examples and those of the many she has counseled and heard from help the reader connect with the stories and see that they're not alone (at all!) and visualize the good and bad results of possible scenarios in their own lives. As she points out repeatedly, there are no two children alike, and each of us will need to think through the strategies we need to implement in our own situation. I appreciate that she emphasizes that the parent must ask themselves hard questions and be able to answer them truthfully before they can even begin to have a plan. Just as the child must be willing to see their problems and be willing to work on them, we parents must do the same, not only with our own problems, but what we are or are not willing to do to help their children. While this book is titled adult children, there is nothing in this book that would not be helpful to the parents of teens or even pre-teens. Reading this could help them stop the problems before they become drastic. We all go through periods or areas of denial when we have suspicions but not confirmation of problems. Imagine saving your child from the brain and organ damage of addiction before it becomes a life-long problem that you're forced to deal with. Imagine the difference of recognizing that your child is actually bi-polor when they've been treated for ADD all along, and being able to switch their medication, thus preventing suicidal episodes, drug addiction and any number of other things that escalate after age twenty for those children. I do wish the book had more examples of success stories, but I am quite sure that Allison hears more from the people who are in distress. Those who are winning the battle simply want to put the past behind them and live in peace. I get that. I want that. If you take the advice she gives and apply it, you have a chance to get there. Whether or not your child turns around, or even if you lose them entirely, God does promise His peace that passes understanding. It's only when you've faced the impossibility of peace and turned to Him that you'll get that too. It is possible to live in peace while knowing that you may lose everything. I've learned this. But I also have to re-learn it daily.